Back in 1994 I won the Form 1 speech competition. I still remember it. I spoke about battery hen farming and how wrong it is on so many levels. I spoke confidently (probably loudly cos I seem to only have one volume – still do! ), and without too much fear, anxiety or nerves. But that was before I was old enough to doubt myself. It was before I was smart enough to know how strongly opinionated those sitting ring-side could be. And it was before social media gave the sideline dwellers a platform to commentate. Thinking about the critics can paralyse you with fear. But in your youth, you have a degree of ignorance, and I think for me, that ignorance allowed me to get out of my comfort zone more than what I do now as an older, wiser adult. 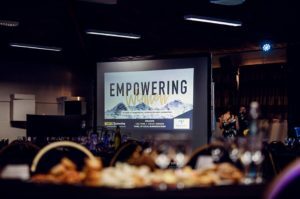 So the night of our Empowering Women event was a milestone for me. I was so scared. Right up until the moment before the event began I was regretting putting myself in this position, and really questioning why. And then, on Sunday, I got in the arena again. Totally different scenario, but still the potential to shine or stumble. It was a 12km run. Of course it would’ve been easier to be a spectator, watching from the sidelines, but instead I got amongst it. I had trained – as much as you can having 3 boys under 5yrs and owning a business – and I had a goal of 1hr 15mins. And I nailed it. 1hr 13mins. The pride and sense of achievement I felt after the run, and after the Empowering Women event, had given me a great reminder why I get into the arena. There was no guarantee of a great outcome with either endeavour, but at least I gave them a shot. You don’t succeed without failing along the way. You don’t get reward without taking risks. You’ve got to take a chance. The easy option is to stand ringside and critique those in the middle, but the real courage, and the real triumph comes from getting in the arena. So I will continued to choose to dare greatly, as Theodore Roosevelt said. This quote of his sums it up, and I think its one of the best.